Cast : Tom Hanks, Ewan McGregor, Stellan Skarsgård, Ayelet Zurer, Armin Mueller-Stahl. Synopsis: When a mysterious device is stolen from a secret laboratory, and planted somewhere inside the Vatican City, a search begins to uncover a mysterious conspiracy that threatens to not only destroy the Papal seat, but the church and Christianity itself. Review : Hanks is in top form, as is McGregor, but again Ron Howard manages to deliver a lukewarm and undercooked thriller, instilling only the barest fraction of excitement Dan Brown’s novel actually inspires into a story that takes us on a wild, provocative journey through the Vatican and Rome itself. The “thriller” aspect of Angels & Demons is woefully average, and Brown’s original religious connotations towards the divinity of God are blown away by methodical perambulation into the most pedestrian of action thrillers. Better than DaVinci, but not by much. Written before the much lauded DaVinci Code, yet filmed as a sequel, Angels & Demons is yet another delving into religious conspiracy and aspects of dogma and history that make for such great dramatic fodder. While perhaps not as controversial as it’s successor, Angels & Demons is Dan Browns introduction to Robert Langdon, the University scholar who becomes involved in a mystery (don’t we all?) involving antimatter, Vatican City, and the Papal Conclave. I remember reading Angels & Demons on a plane back from a trip to Europe, the book was so fast paced and engrossing that I couldn’t put it down, even though the dialogue was inordinately clunky, and large lapses in logic had to occur for things to move forward within the context of the book. The book itself is a breathless thriller which never ceases, almost to the last page, and if you’re anything like me you won’t be able to help being drawn in to the story. However, the film is an entirely different beast. And it’s not as I imagined. When the film version of The DaVinci Code was released back in 2006, there was much consternation among religious zealots and extremists for people not to see the film, not so much for objectionable content in regards to violence or anything like that, but for the themes of blasphemy that the film, taken directly from the book, espoused. With Angels & Demons, the hoopla of the film being made was virtually non-existent. At least, here in Australia, there was almost no advertising of promotion of the film to the extent accorded to DaVinci Code. Which was surprising, since both books dealt with quite serious matters of faith and the power of the Church over its flock. And while DaVinci dealt almost exclusively with the fact that Jesus Christ may not have been the divine being Christians have been told he was, and that he had children, Angels & Demons threatened to blow the lid on God himself, a much bigger fish, if you’ll pardon the Christian analogy. So why then did Angels & Demons swim almost unheard of through cinemas and out onto DVD with nary a glimmer of controversy? Perhaps we’d all become weary of Dan Browns “revelations” to the point that we simple chose to ignore them? Hardly an excuse, I wouldn’t think, although Angels & Demons does bear to be scrutinized for what it is: a simple, brutally exciting exercise in religiously themed convolution, full of intrigue and deception at even the highest levels of the Catholic Church. Angels & Demons is set almost exclusively in Vatican City, as well as a small part of old Rome. The novel’s variant includes Robert Langdon, a University lecturer in symbols and religious iconography, being whisked to CERN, a top secret scientific facility in Switzerland, prior to traveling to Rome; in the film, he’s whisked directly to the Vatican. The film version of the story precludes any preamble about Robert Langdon; this, after all, is a sequel, and assumes you’re one of the millions of people who saw The DaVinci Code. Like DaVinci, the films’ story begins almost immediately, with the death of a scientist in CERN and the theft of a canister of highly unstable substance known as antimatter: held within the canister it’s quite safe, although should the battery holding it in stasis fail, the resulting explosion would destroy a large section of the Earth before the day was out. The battery on the canister, we learn, will expire within 12 hours. There, that’s the time-frame. Everything else is secondary, as far as we’re concerned. Robert Langdon is summoned to the Vatican to identify and assist in the recovery of four kidnapped Cardinals, who we learn are due to be involved in the Papal Conclave (the choosing of the next Pope, since the last one has just passed away) before going missing. The only clue is a fax sent to the Vatican with the word “Illuminati” written on it. Langdon, together with the scientific partner of the murdered CERN scientist, Vittoria Vetra, must uncover the secret of the Illuminati, a secret scientific organization persecuted by the early Church and eventually driven underground, in order to locate the missing Cardinals, find the secretly hidden anti-matter bomb, and save Rome from complete annihilation. Having read the novel, it’s great to be able to sit back and watch how the filmmakers decided to deviate from Brown’s text (which would have been largely unfilmable in a direct way) and create a workable story from it. To be honest, screenwriters David Koepp (who penned Jurassic Park, Stir Of Echoes, Panic Room, Spider-Man, Spielberg’s War Of The Worlds, and the most recent take on Pelham 123) and Akiva Goldsman (responsible for travesties like Batman & Robin, Lost In Space and Deep Blue Sea, as well as Oscar winners A Beautiful Mind, I Robot and Cinderella Man) have taken Brown’s story and tried to inject some cinematic sensibilities to it. Much of the talky dialogue for which Brown is renowned has been pared back to the barest of minimums, only the most pertinent information required to get the point across. The problem with Angels & Demons’ script is that it’s unable to handle such a paring back of Brown’s story. Brown’s depth of research (accurate or not) is so important to the novel as a whole that without context and explanation, the whole thing falls a little flat. Unfortunately, Goldsman and Koepp have failed to incorporate that incredible detail into a script that’s coherent and exciting. Especially interesting is the way they’ve tried to shoehorn Brown’s dialogue heavy story, in which characters expound us with so much clunky exposition, into an adequately descriptive screenplay. I often tried to visualize people actually saying some of the things Dan Brown writes, and found that, like The DaVinci Code as well, it’s laughably incredible. Ewan McGregor minus a lightsabre. The film flounders through it’s first twenty minutes, barely giving us any relevant information and simply showing moments that we subliminally know we should be paying attention to. And what information is passed onto us as viewers is so quickly delivered, so flippantly relayed from the brain of Langdon that it’s almost an afterthought that the filmmakers should deign to keep us up to speed with what’s happening. Procedural moments in the Vatican, including the vote for a new Pope, the traditions and events surrounding Conclave, are glossed over quite briefly, if they’re included at all, in some instances. My wife, Lisa, watched the film with me, and she hadn’t read the book; consequently, she continued to ask me questions to clarify exactly what was happening. I took the view that had I not been already familiar with the novel, I myself would have been bamboozled as well. Vatican preamble might have been appropriate for those people not familiar with Catholic tradition. Regardless, assuming people watching the film have read the book is an almost fatal mistake. Ron Howard himself has directed some masterful movies in his time, as his status as an A-List director will attest. But, like all of them, he’s also made some dogs. Far and Away, The Missing (which many thought was quite good, actually bored me to death) and The DaVinci Code all managed to miss the mark, and I had hoped after DaVinci that Howard had found his mojo again. Cinderella Man, Beautiful Mind, Frost/Nixon, all brilliant films that were driven primarily by character, and succeeded magnificently. DaVinci Code, which was about as far from character driven as you can get, and Angels & Demons, which used the same structure, were storytelling failures from a director normally adept at crafting a story out of the smallest detail. Ron Howard’s ability to direct a frenetic story like Angels & Demons was limited to a simple case of editing and pacing. I don’t think he “got” it. 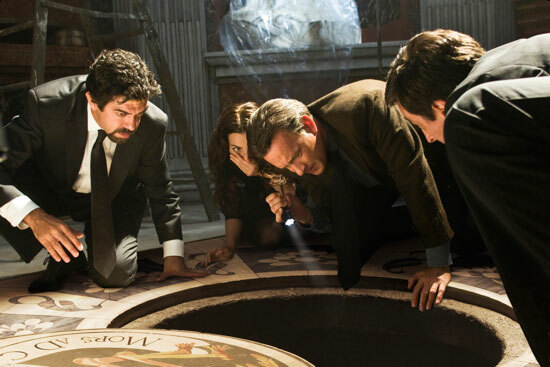 The film lacks the zing it so desperately needs, similarly to the problem encountered with DaVinci Code. His heart just doesn’t appear to be in it. So what’s good about Angels & Demons as a film? First, the appearance of Tom Hanks and Ewan McGregor add significant enthusiasm to the viewing experience, their acting chops going a long way to the credibility of the picture. Poor Hanks has yet again been dudded in the character development stakes, mainly due in part to Dan Brown’s insistence on not providing anything but the barest detail on Robert Langdon in both his novels featuring this character so far. Moments in the book, particularly Langdon’s Mickey Mouse watch, are barely touched upon in the film, moments that could really enhance the character more than a simple “you are a symbols expert” sentence, which is about all the development we are afforded in Hanks’ portrayal. McGregor, the chief aide to the former Pope, is known by his label the camerlengo, a mouthful of a title if ever there was one. McGregor gives a nuanced, effortless performance of a man in a high stressed situation, however, as with Hanks, is criminally undone by a lack of motivation and depth of character. 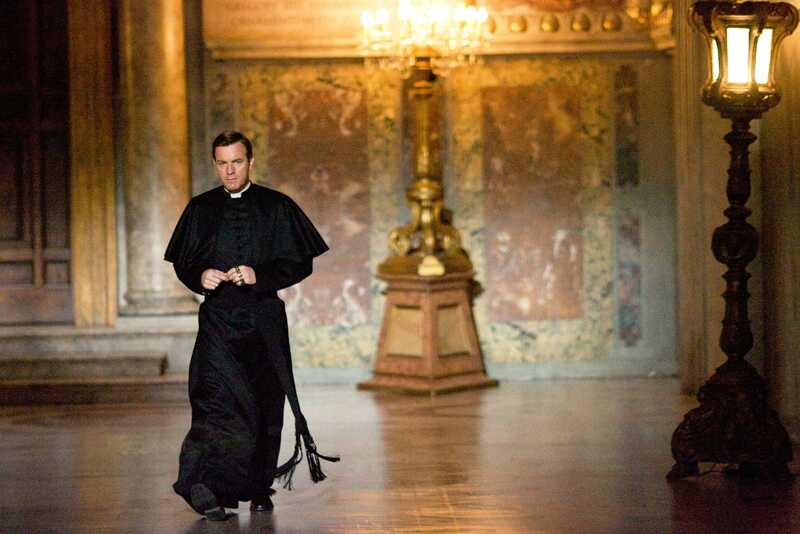 His performance is rewarded with a particularly stirring speech to the assembled Cardinals in Conclave, in which he asks that they put aside their worldly problems and restore the church to it’s past glory, is a moment of real power in a film largely devoid of it. It’s not entirely McGregor’s fault, since the script deviates somewhat from the novel in the camerlengo’s narrative, and neither Goldsman nor Koepp afford the character anything more than a simple, inelegant back-story that does nothing to broaden our understanding of the situation. Scripting aside, Ron Howards use of location is pretty consistent with Browns novel; the magnificent backdrop of Rome and Vatican City provides a great setting for the story, even if the majority of the film was shot on enormous sets at a backlot in Hollywood. The digital effects used to generate the interior of monolithic structures like St Peter’s Basilica and other monuments inside Rome (including the Pantheon, which is perhaps the least impressive effects shot in the film) are reasonably cool, although they still retain a little “Star Wars prequel” feel to them in their “fakeness”… sorry, but there’s no other word for it. Generally, though, the effects work is first rate, adding to the moody, atmospheric feel the film has. Perhaps the best part of Angels & Demons is the use of Hans Zimmers musical themes from DaVinci Code, which make a welcome and subtle return here. Zimmer is among the highest calibre of film composers working today, although some of his most recent work has tended to become slightly repetitive and boring (although, I might add, his score to The Dark Knight is simply brilliant!). Here, however, Zimmer brings a kind of circular theme to the film, a link to the previous movie while remaining new and fresh here again. There wasn’t as much oratorio or choral work in the score, as I had imagined there would be for a film set in the most famous church in all of Christendom. What Zimmer does manage to do effortlessly is bring a sense of restrained power to his score, some haunting melodies and themes permeating the fabric of the movie that seems to exist almost ethereally, rather than forcefully like many of the composers’ other recent scores. If that’s the good, where does Angels & Demons go wrong? To begin with, the first fifteen, twenty minutes or so of the film are flat out boring, a concoction of barely coherent techno-babble and flim-flammery, in which the major players of the film are briefly introduced (or not introduced, as the case of Vittoria may be…. more on this in a moment) and events are set in motion. It’s the kind of film-making that assumes you’ve read the book and know what’s going on. And that’s bad filmmaking folks, because for those coming in cold, you’ll be struggling to keep up with what’s happening. There’s a subtle difference between explaining things to an audience in an intelligent and cinematic way, and simply browbeating people over the head with information and hoping they get it. Here, it’s the former, and it’s hard as heck to keep up with things happening so fast. One moment we’re in Switzerland, watching Vittoria tread around her partners eye on the floor (don’t ask), and the next we’re standing eyeball to eyeball with the chief of the Swiss Guard, waiting for Langdon to gain access to the super-secret Vatican Archives, a place nobody gets to go into save written mandate from the Pontiff himself. Entire characters from the novel are overlooked for the film, including the massively emotional hook that the scientist murdered at the beginning is actually Vittoria’s father. This fact is never mentioned in the film, and as a result, the logic as to why Vittoria, whose character is never really developed, is even involved in the film, is missing. Vittoria is essentially a nameless cypher, a character in the film who exists simply as a foil for Langdon, and not a very good one at that. Her opening scene, in which she and her “father” generate anti-matter, is confusing, unexplained, and mysteriously devoid of development. Poor Ayelet Zurer, who plays Vittoria, must be given kudos for at least trying to make her character as human as possible, but within the confines of such an enormous storyline, she didn’t ever have much hope of being more than a simple cypher. In the book, Vittoria is a much more developed character (although barely at the same level as Langdon himself, which isn’t saying much) yet here, she’s simply an appendage, a way for the story to transition from one moment to another by having her simply run up, spout some illogical scientific mumbo-jumbo, before running off again. It’s annoying, and demeaning to the viewer. A central character from CERN itself, the man who runs the whole shebang, is removed from the film completely. Maxmillian Kohler, the snappy, belligerent man in charge at CERN, plays a pivotal role in getting Langdon involved, and motivates the events that follow throughout the novel. His role is moved to others in the film, although this lack of pivotal antagonist leaves a void in the film overall. The catalyst, rather than being the hunt for the bomb, is refocused by Howard and the screenplay to more involve the hunt for the missing Cardinals. Given that the emotional hook to the Cardinals, and their plight, is badly developed in the script, this mutes any feelings we have to the emergency thrillers aspect the film tries to engender. Without Kohlers presence in the film, the novels twist ending is reorganized by Howard, Goldman and Koepp into a hodgepodge of sideways glances, illogical story progression, and ill-advised modifications. At least we know where the script for this film came from…. There are other, smaller, modifications to the story in it’s film version that don’t impact overall, and truthfully, save the aforementioned removal of Mr Kohler, the novel and film follow each other closely. The more incredible aspects of the novel, such as Robert Langdon’s surviving a fall from great height after the explosion of the helicopter he’s riding in, have been excised from the film, which is a positive note. 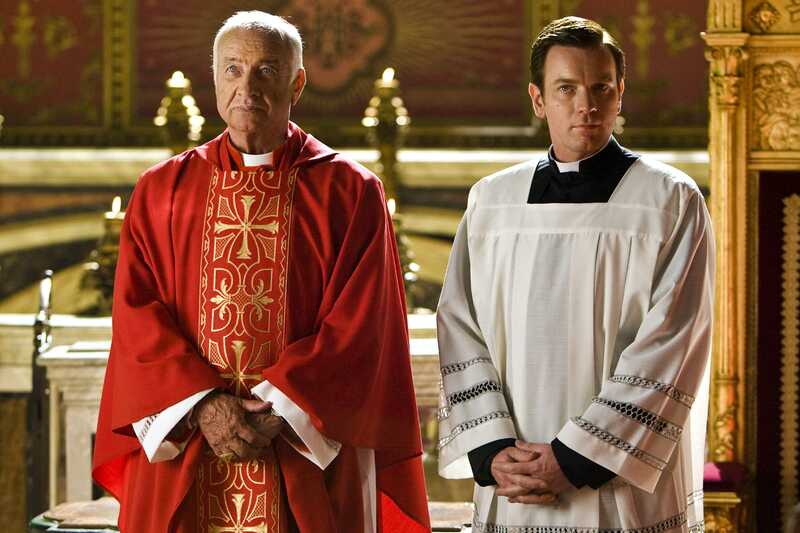 The novel uses a narrative involving the media (assembled for the Conclave result) to further the plot and to generate even more tension, and while there are glimpses of media scrums in the Vatican in the film, this story point has also been excised from the film version. Perhaps to it’s detriment. However, it is the films conclusion, which removes the more religiously ethereal aspects of the novels closing chapters, that is perhaps the weakest moment. Controversial moments in the novel, in which it’s revealed the late Pope bore a son (thanks to genetic manipulation; science, as it were) as well as the argument regarding science trying to diminish God as an entity, and explain all things scientifically, are either lost or minimized in the film version, and this in itself diminishes the emotional weight of the movie overall. The concepts Brown unloaded upon the reader, thus giving the book some authoritarian leverage, are crucial to the films momentum, and rather than try and expand the narrative to make the ethics, morals and religious implications of the affairs involved in the novelized version pertinent here too, the filmmakers seemed to side with simply action and simple “conspiracy” theories that, after a while, begin to wear thin. If you’re going to eliminate the crucial motivations for “why” everything occurs, then you’re essentially producing an empty shell of a story and giving the audience nothing to emotionally invest in. And that results in a wafer-thin film with limited appeal. It’s barely coherent, a convoluted mess cinematically, and this is the most disappointing part about it all. The reason everything happens becomes lost in so much noise, explosions and gunfire. The “why” is lost, leaving only a “huh?”. Simply put, the film has missed out crucial elements of Brown’s original story, and this hamstrings any originality the film may have possessed had it been more faithful to the novel. I’ll admit to enjoying Dan Brown’s novels purely on an entertainment and escapist basis, and I had high hopes for this film effort after the lackluster DaVinci Code. Unfortunately, I feel that the mark has again been missed, although the film still earned enough to ensure the next Brown tome, The Lost Symbol, will also be made into a movie. Angels & Demons will entertain purely on a superficial level, if not for the exceedingly cool Hanks getting about Rome and the Vatican showing off, and the loving way Rome herself has been captured by Ron Howards loving lens. Bot for those looking for a more detailed story, a provocative or controversial affair that we have now come to expect from Dan Brown, then this film version of Anegls & Demons will leave you wanting.